When you hear the word “leak” you possibly conjure up a broken faucet or dripping shower head. However, while those type of leaks can cause potential damage to your home, they are not nearly as serious as a gas leak. If you suspect your home or business may have a gas leak, you need to have it checked…immediately! 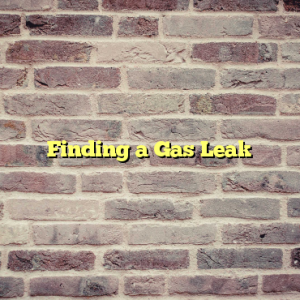 Thankfully, there are services that can help do just that—detect a gas leak. Armed with expertise and the right equipment, a gas leak detector can give your home, office or building a thorough and true inspection. Oftentimes, you may smell that strong rotten-egg like odor of gas in, around or even near your property or office; this is the biggest indication that there is a leak. Immediate evacuate if you suspect there is a gas leak and open any doors you can to dissipate the gas. Don’t unplug any items, flick on a flashlight or even chance using your cell phone until you are off the property; any of these items could spark the gas. When checking your home for a gas leak, make sure you do not use a candle, matches, a lighter, or even a flashlight.If you have a gas water heater or your washer and dryer have a gas line, make sure you store clothing and other flammable items away so they don’t catch fire if in the event of an emergency. While your gas leak may not be anything serious, it is not worth the risk in finding out. Even if there is a hint of a gas smell, get out and call a reputable company to do the inspection. The other major sign that there may be a gas leak is a hissing sound; if you note a constant, low hissing sound, it may be a pressurized gas leak and you will want to evacuate and then call an expert technician to investigate. While gas appliances, including cooktops, washers and dryers, ovens, fire pits and water heaters are the preference of many homeowners, there is always the potential for a gas leakage problem.Proper venting is key, and the piping must be correct to ensure the gas does not leak into the home. Finding a company that specializes in gas detection is exceptionally important because dealing with natural gas and propane lines can be very dangerous, and your technician should be highly trained. If a leak is detected, make sure they can bring the lines up to current building code safety standards. To find a reputable gas leak detection company that focuses on the eastern area of the United States, you can visit the Better Business Bureau’s website and Yelp! Solid recommendations from friends and family can also steer you in the right direction. Make sure the company is bonded, licensed and insured. Another way you may determine you have a gas leak is if you notice a spot of brown grass, or a dying tree on the property. Not always, but these can be an indication of an underground gas leak.Usually, unsafe digging is what damages an underground gas line to rupture, and can disrupt service to the neighboring buildings. Gas lines should be properly marked, but if a gas line is inadvertently hit, whomever digs and hits the line can be assessed fines and repair costs. If you need to dig, even in your own yard, make sure you don’t have any type of water, power or gas lines underground. Always call the appropriate utility company days before you plan to strike ground. If you are unsure how deeply the underground pipes may be, you can have a gas detection company to come out and use specialized equipment to help you avoid a catastrophe. The equipment works much like sonar; waves bounce off the pipes to the surfacing, indicating how far underground the gas lines are laid. One way to ensure your home or work environment is safe is to set up an annual gas leak inspection. If an issue is found, you will be given information on its whereabouts, its size and its hazard potential. This type of service can certainly give peace of mind if you are located near an underground line or you deal with hazardous materials that could potentially ignite near a gas leak or if you are planning an excavation process. Finding a gas leak before a dig can save lives and money! To find gas leaks, specialized equipment is used. The highly sophisticated Flame Ionization Detector, or (FID), is very sensitive to organic compounds and can tell if there is an underground leak present.H25-IR Pro industrial grade gas leak analyzer is another tool utilized by a leak detection company.Many companies can also offer additional services including installation, repair and maintenance of gas lines, depending upon your home or business needs. Some offer re-piping services or even conversion services to take a home from electric to gas. When you settle on a gas leak detection services for your home or office, you will want to get some estimates to compare. Material costs are always a consideration, especially if a special line is being used for propane or natural gas. Labor costs can vary and will depend upon the service being provided. Depending upon how deeply the technician has to dig and the technical challenge of the project he must face will determine how expensive your costs will be. Whatever you do, do not attempt to repair the gas line yourself. This dangerous task should be left to experienced technicians. Having a gas leak at your home or office is not only scary, but it can be potentially dangerous. A professional should come and check your home or building if you suspect you have a gas leak, and then you should set up an annual maintenance with a reliable company that specializes in gas leak protection. It’s not work the risk, especially if you have all gas appliances in your home or you work around or near flammable chemicals. It is better to be safe than sorry!